Not as dangerous as actual rock climbing, but also not as much fun, either. 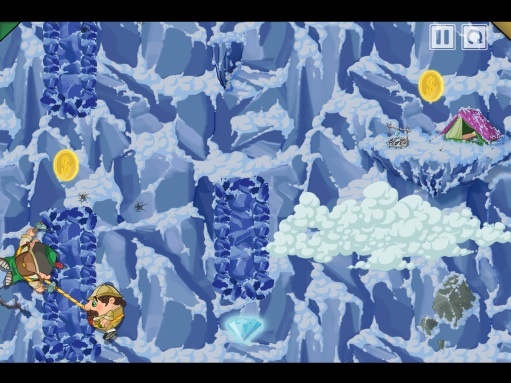 Climber Brothers, from Esquilax Games, tasks players with skillfully maneuvering two intensely happy bros to their campsite, collecting gold coins and diamonds through 63 levels, but there's a catch. Characters Greg and Jeff attached a piece of rope to each other, forcing you to ascend and descend mountains by swinging the free sibling to safety. It's sort of like learning to walk, putting one brother in front of the other. In this case, you must figure out how each brother will behave when you press either the left or right side of the screen, since doing this sets either Greg or Jeff in motion. Then it's a matter of going left, right, left and right until you reach the aforementioned camp. Not a bad idea, but we found the game too frustrating to enjoy. Making one wrong move ruins the attempt, forcing you to restart in excess of several times. What's more, the developers ask you to do some silly things, like drop the brothers off the mountain and then press the screen with both thumbs to help them latch onto the rock, whereupon which you'll then swing one of them through a narrow opening. It's all in the timing, but good luck with that. Miss the camp by a hair? Restart. One brother accidentally disappears off screen? Restart. Failed to swing Jeff past a bothersome object? Restart again. On top of that, the brothers for some reason forgot how to walk (they roll), so if by chance one of them lands on a platform, that's it. Restart. Making this worse are forces of nature (beware the fog) that make this disappointing title even more annoying. 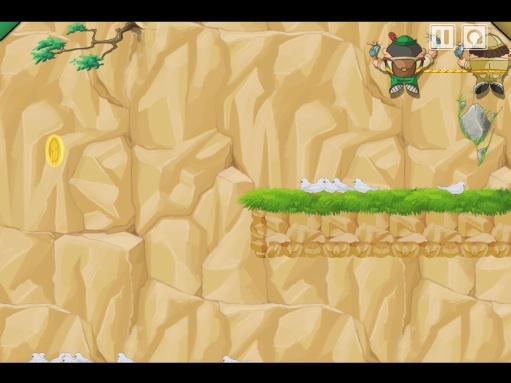 It has some good concepts, but ultimately, Climber Brothers is much too irritating to enjoy. Requirements: Compatible with iPhone, iPod touch, and iPad. Requires iOS 3.1.2 or later. What's Hot: Colorful 2D graphics, Retina and Game Center support, universal. What's Not: Big learning curve, boring, frustrating.